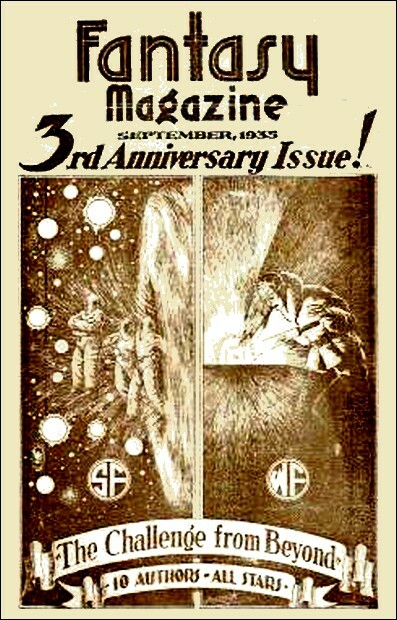 In 1935, the editor of Fantasy Magazine asked five prominent science fiction writers and five prominent fantasy writers to write two "round-robin" stories, both called The Challenge From Beyond. The authors of the fantasy version were C.L. Moore, A. Merritt, H.P. 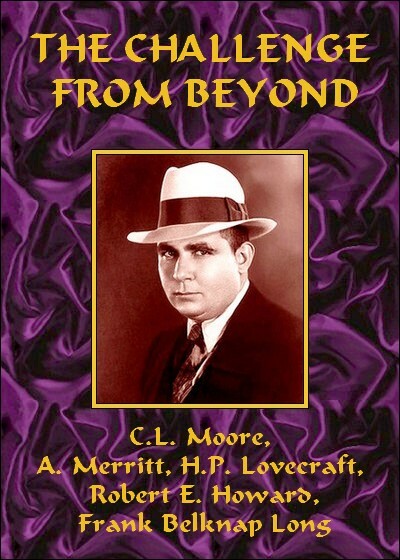 Lovecraft, Robert E. Howard and Frank Belknap Long. The science fiction version was written by Stanley G. Weinbaum, Donald Wandrei, Edward E. (E.E. Doc) Smith, Harl Vincent, and Murray Leinster. In the following text, the name of the author of each section of the story is given in brackets. George Campbell opened sleep-fogged eyes upon darkness and lay gazing out of the tent flap upon the pale August night for some minutes before he roused enough even to wonder what had wakened him. There was in the keen, clear air of these Canadian woods a soporific as potent as any drug. Campbell lay quiet for a moment, sinking slowly back into the delicious borderlands of sleep, conscious of an exquisite weariness, an unaccustomed sense of muscles well used, and relaxed now into perfect ease. These were vacation's most delightful moments, after all—rest, after toil, in the clear, sweet forest night. But the most curious thing of all was that shape he could make out dimly in the heart of the crystal. For imbedded in its center lay a little disc of a pale and nameless substance with characters incised deep upon its quartz-enclosed surface. Wedge- shaped characters, faintly reminiscent of cuneiform writing. George Campbell wrinkled his brows and bent closer above the little enigma in his hands, puzzling helplessly. How could such a thing as this have imbedded in pure rock crystal? Remotely a memory floated through his mind of ancient legends that called quartz crystals ice which had frozen too hard to melt again. Ice—and wedge-shaped cuneiforms—yes, didn't that sort of writing originate among the Sumerians who came down from the north in history's remotest beginnings to settle in the primitive Mesopotamian valley? Then hard sense regained control and he laughed. Quartz, of course, was formed in the earliest of earth's geological periods, when there was nothing anywhere but heat and heaving rock. Ice had not come for tens of millions of years after this thing must have been formed. He lay there, it seemed to him, for hours. It had been the lingering light, the luminescence that seemed so reluctant to die, which held his mind. It was as though something in the heart of the cube had awakened, stirred drowsily, become suddenly alert... and intent upon him. He sat, watching the luminescence glow and fade, glow and fade, but steadily becoming dimmer. It came to him that two elements were necessary to produce the phenomenon. The electric ray itself, and his own fixed attention. His mind must travel along the ray, fix itself upon the cube's heart, if its beat were to wax, until... what? As though at command, the sapphire lightnings burned forth. They burst from the disc into the body of the crystal cube, then beat back, bathing the disc and the markings. Again these began to change, shifting, moving, advancing, and retreating in the blue gleaming. They were no longer cuneiform. They were things... objects. He heard the murmuring music, the plucked harp strings. Louder grew the sound and louder, and now all the body of the cube vibrated to their rhythm. The crystal walls were melting, growing misty as though formed of the mist of diamonds. And the disc itself was growing... the shapes shifting, dividing and multiplying as though some door had been opened and into it companies of phantasms were pouring. While brighter, more bright grew the pulsing light. He felt swift panic, tried to withdraw sight and will, dropped the flash. The cube had no need now of the ray... and he could not withdraw... could not withdraw? Why, he himself was being sucked into that disc which was now a globe within which unnameable shapes danced to a music that bathed the globe with steady radiance. There was no tent. There was only a vast curtain of sparkling mist behind which shone the globe... He felt himself drawn through that mist, sucked through it as if by a mighty wind, straight for the globe. As the mist-blurred light of the sapphire suns grew more and more intense, the outlines of the globe ahead wavered and dissolved to a churning chaos. Its pallor and its motion and its music all blended themselves with the engulfing mist-bleaching it to a pale steel-colour and setting it undulantly in motion. And the sapphire suns, too, melted imperceptibly into the greying infinity of shapeless pulsation. It was very suddenly, and amidst the most impenetrable darkness, that thoughts and ideas again came to George Campbell. Of how many moments—or years—or eternities—had elapsed since his flight through the grey void, he could form no estimate. He knew only that he seemed to be at rest and without pain. Indeed, the absence of all physical sensation was the salient quality of his condition. It made even the blackness seem less solidly black—suggesting as it did that he was rather a disembodied intelligence in a state beyond physical senses, than a corporeal being with senses deprived of their accustomed objects of perception. He could think sharply and quickly —almost preternaturally so—yet could form no idea whatsoever of his situation. Half by instinct, he realised that he was not in his own tent. True, he might have awaked there from a nightmare to a world equally black; yet he knew this was not so. There was no camp cot beneath him—he had no hands to feel the blankets and canvas surface and flashlight that ought to be around him—there was no sensation of cold in the air—no flap through which he could glimpse the pale night outside... something was wrong, dreadfully wrong. It was not, however, in the writings of any sober scientist that Campbell had seen that reference to a crystal, disc-holding globe. The source was far less reputable, and infinitely more vivid. About 1912 a deeply learned Sussex clergyman of occultist leanings—the Reverend Arthur Brooke Winters-Hall—had professed to identify the markings on the Eltdown Shards with some of the so-called "pre-human hieroglyphs" persistently cherished and esoterically handed down in certain mystical circles, and had published at his own expense what purported to be a "translation" of the primal and baffling "inscriptions"—a "translation" still quoted frequently and seriously by occult writers. In this "translation'—a surprisingly long brochure in view of the limited number of "shards" existing—had occurred the narrative, supposedly of pre-human authorship, containing the now frightening reference. Beyond the limits of their own galaxy—which was not ours—they could not navigate in person; but in their quest for knowledge of all space and time they discovered a means of spanning certain transgalactic gulfs with their minds. They devised peculiar objects—strangely energized cubes of a curious crystal containing hypnotic talismans and enclosed in space-resisting spherical envelopes of an unknown substance—which could be forcibly expelled beyond the limits of their universe, and which would respond to the attraction of cool solid matter only. The mind that noticed the cube would be drawn into it by the power of the disc, and would be sent on a thread of obscure energy to the place whence the disc had come—the remote world of the worm-like space explorers across stupendous galactic abysses. Received in one of the machines to which each cube was attuned, the captured mind would remain suspended without body or senses until examined by one of the dominant race. Then it would, by an obscure process of interchange, be pumped of all its contents. The investigator's mind would now occupy the strange machine while the captive mind occupied the interrogator's worm- like body. Then, in another interchange, the interrogator's mind would leap across boundless space to the captive's vacant and unconscious body on the trans-galactic world—animating the alien tenement as best it might, and exploring the alien world in the guise of one of its denizens. In other cases sections of the worm-folk would permanently occupy a trans-galactic planet—destroying the captured minds and wiping out the remaining inhabitants preparatory to settling down in unfamiliar bodies. Never, however, could the parent civilization be quite duplicated in such a case; since the new planet would not contain all the materials necessary for the worm-race's arts. The cubes, for example, could be made only on the home planet. Realising that the changed individuals represented invading minds, the race's leaders had them destroyed—even at the cost of leaving the displaced minds exiled in alien space. They had had experience with even stranger transitions. When, through a mental exploration of space and time, they formed a rough idea of what the cube was, they carefully hid the thing from light and sight, and guarded it as a menace. They did not wish to destroy a thing so rich in later experimental possibilities. Now and then some rash, unscrupulous adventurer would furtively gain access to it and sample its perilous powers despite the consequences—but all such cases were discovered, and safely and drastically dealt with. Of this evil meddling the only bad result was that the worm- like outside race learned from the new exiles what had happened to their explorers on earth, and conceived a violent hatred of the planet and all its life-forms. They would have depopulated it if they could, and indeed sent additional cubes into space in the wild hope of striking it by accident in unguarded places—but that accident never came to pass. This much, according to the learned occultist, the Eltdown Shards had said. What now made the account so obscurely frightful to Campbell was the minute accuracy with which the alien cube had been described. Every detail tallied—dimensions, consistency, heiroglyphed central disc, hypnotic effects. As he thought the matter over and over amidst the darkness of his strange situation, he began to wonder whether his whole experience with the crystal cube—indeed, its very existence—were not a nightmare brought on by some freakish subconscious memory of this old bit of extravagant, charlatanic reading. If so, though, the nightmare must still be in force; since his present apparently bodiless state had nothing of normality in it. He seemed to be in a room of considerable extent—of medium height, but with a large proportionate area. On every side—and he could apparently see all four sides at once—were high, narrowish slits which seemed to serve as combined doors and windows. There were singular low tables or pedestals, but no furniture of normal nature and proportions. Through the slits streamed floods of sapphire light, and beyond them could be mistily seen the sides and roofs of fantastic buildings like clustered cubes. On the walls—in the vertical panels between the slits—were strange markings of an oddly disquieting character. It was some time before Campbell understood why they disturbed him so—then he saw that they were, in repeated instances, precisely like some of the hieroglyphs on the crystal cube's disc. The actual nightmare element, though, was something more than this. It began with the living thing which presently entered through one of the slits, advancing deliberately toward him and bearing a metal box of bizarre proportions and glassy, mirror- like surfaces. For this thing was nothing human—nothing of earth—nothing even of man's myths and dreams. It was a gigantic, pale-grey worm or centipede, as large around as a man and twice as long, with a disc-like, apparently eyeless, cilia- fringed head bearing a purple central orifice. It glided on its rear pairs of legs, with its fore part raised vertically—the legs, or at least two pairs of them, serving as arms. Along its spinal ridge was a curious purple comb, and a fan-shaped tail of some grey membrane ended its grotesque bulk. There was a ring of flexible red spikes around its neck, and from the twistings of these came clicking, twanging sounds in measured, deliberate rhythms. A lawless exultation rose in him. He was a man without a world, free of all conventions or inhibitions of Earth, or of this strange planet, free of every artificial restraint in the universe. He was a god! With grim amusement he thought of his body moving in earth's business and society, with all the while an alien monster staring out of the windows that were George Campbell's eyes on people who would flee !f they knew. He started. Yekub! It was the name of this planet, but how had he known? Then he knew, as he knew the name of him whose body he occupied—Tothe. Memory, deep grooved in Tothe's brain, was stirring in him—shadows of the knowledge Tothe had. Carved deep in the physical tissues of the brain, they spoke dimly as implanted instincts to George Campbell; and his human consciousness seized them and translated them to show him the way not only to safety and freedom, but to the power his soul, stripped to its primitive impulses, craved. Not as a slave would he dwell on Yekub, but as a king! Just as of old barbarians had sat on the throne of lordly empires. But Campbell gave no heed, for he had made his desperate plan, a plan so alien to the ways of Yekub that !t was beyond Yukth's comprehension and caught him wholly unprepared. Yukth, like Campbell, saw the sharp-pointed metal shard on a nearby table, but to Yukth !t was only a scientific implement. He did not even know it could be used as a weapon. Campbell's earthly mind supplied the knowledge and the action that followed, driving Tothe's body into movements no man of Yekub had ever made before. In a far-off world of outer space the centipede creature that was George Campbell clasped to ts bosom a god whose lineaments were red as blood, and ran with insect-like quiverings across a rainbow-hued hall and out through massive portals into the bright glow of alien suns. "On all earth, living creatures rend one another, and feast with unutterable cruelty on their kith and kin. No worm-mind can control a bestial man-body when it yearns to raven. Only man- minds instinctively conditioned through the course of ten thousand generations can keep the human instincts in thrall. Your body will destroy itself on earth, seeking the blood of its animal kin, seeking the cool water where it can wallow at its ease. Seeking eventually destruction, for the death-instinct is more powerful in it than the instincts of life and it will destroy itself in seeking to return to the slime from which it sprang."